At SmilesByGlerum.com, we’re known for our state-of-the-art approach to dentistry. This includes the latest in sterilization techniques as well as tools and equipment to optimize your dental experience. Dr. Glerum and her staff have undergone extensive training so that you can enjoy the benefits of leading-edge dental care. You need to fully understand the condition of your mouth and the treatments we prescribe. CAESY is our patient education program. The videos and information CAESY presents will help you understand your options so you can make informed decisions regarding your dental health. Click here to learn more. Our Diagnodent Laser locates decay below the gum line and between teeth. It can even detect areas prone to future decay so that we can work with you on prevention. Cavities found early can often be treated conservatively without the use of anesthetic. Have you always wanted orthodontic treatment, but you feel like braces would make you look immature or unprofessional? Invisalign is the innovative orthodontic treatment for adults. Ask about a free consultation! Our intraoral camera will project images from inside your mouth onto a monitor. We can show you the condition of your smile and better explain the procedures we recommend. In addition, Dr. Glerum and our team can assess your oral health down to the smallest detail. We use our Biolase® diode laser to recontour gums, remove overgrowths, and many other soft-tissue procedures. Reduction of bacteria and inflammation can often be achieved without the need for anesthetic. 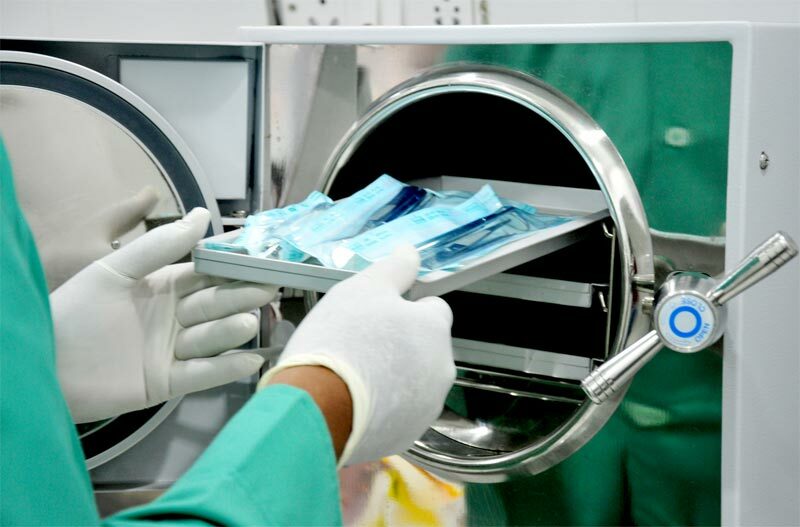 In our sterilization station, we use state-of-the-art technology, including hands-free features and color-coded sterile and non-sterile units that meet or exceed OSHA standards. Oral cancer will be diagnosed in more than 30,000 patients this year. Five years from now, only 57% of those patients will be alive. 27% of oral cancer patients don’t smoke or drink alcohol. Rod Stewart, Sigmund Freud, Aaron Spelling, and even the Sultan of Swat, Babe Ruth, were struck by oral cancer. It’s a stealthy disease that often isn’t detected until after it has spread to the neck and lymph nodes. Because we’re interested in your whole-body health, we provide oral cancer screenings with ViziLite®, a revolutionary technology that can detect oral cancer in the earliest stages. When caught early, oral cancer can be cured in 90% of patients. Dr. Glerum and her team examine patients for oral cancer at every visit. Dr. Glerum’s office is one of the first dental offices in Palm Beach County to use ViziLite®. The screening is painless and quick, and it could save your life. Zoom! Whitening dramatically whitens teeth in less than an hour. You can relax to music or a DVD while we brighten your smile up to ten shades. This is the same whitening procedure used on ABC’s Extreme Makeover, and it is the only one endorsed by the show’s host, Dr. Dorfman. We believe that while healthcare is vital and necessary to the well-being… there’s no need for it to be uncomfortable. In fact, it should be pampered and downright enjoyable! That’s why we aim for total, complete, VIP 5-Star Service for you while in our care. Your comfort and personalized attention should come first.